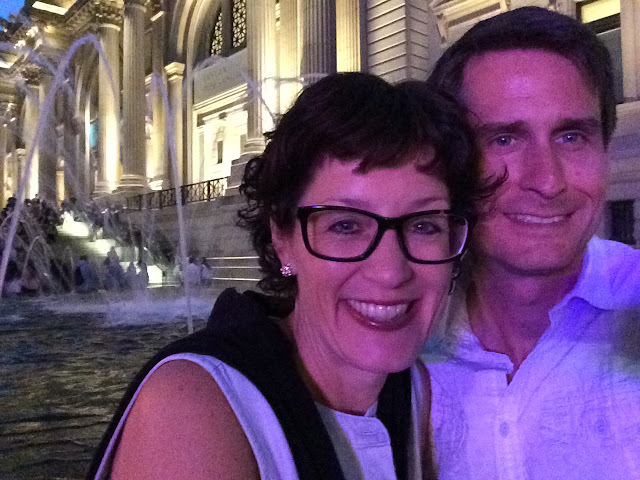 The Adventures of Scott & Caroline: Museum Mile Festival in NYC, aka the Sport of Waiting In (I mean, On) Line! Museum Mile Festival in NYC, aka the Sport of Waiting In (I mean, On) Line! 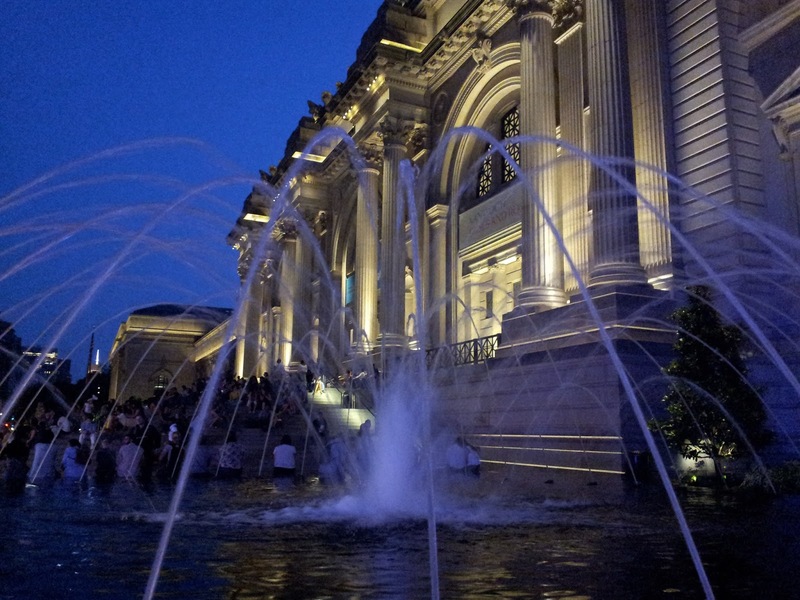 In NYC, summer is the season of festivals, and many of them are free for the taking. Last night was the annual - and free - Museum Mile Festival, a block party of sorts that takes place on the Upper East Side of Manhattan right on 5th Avenue, covering the blocks where such famous museums as the Metropolitan Museum of Art and the Guggenheim reside, in addition to several lesser known museums. I had read somewhere that this is quite a popular festival, and being New Yorkers as we now are, we thought we had better go and check it out and be part of the fabric of NYC on a Tuesday evening. For the festival, from 6 - 9 pm, 5th Avenue is blocked off to car traffic and apparently, people - adults and children alike - are encouraged to write and draw all over the street with sidewalk chalk that is handed out. There was a live band playing in front of the Guggenheim and a clown doing a street performance of some kind was on hand. But this was all in the background of the real attraction. On this one night a year, the museums on this mile-long stretch of tony 5th Avenue open their doors to the public, completely free of charge! At about 7:30, we got off the subway at 86th St., just a few blocks from the Guggenheim, our initial target, and began to make our way towards 5th Ave. Before long, we spied a line. A very, very long line. 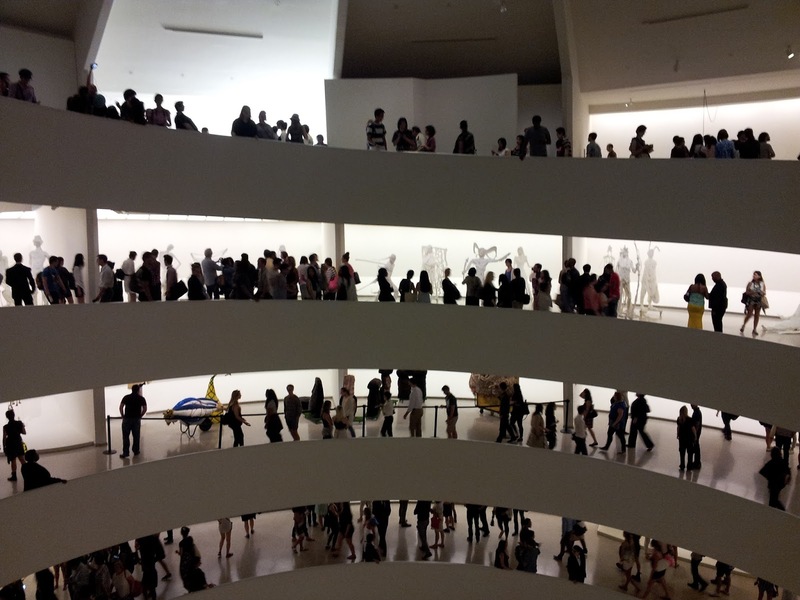 A line to get into the Guggenheim. Sigh. After walking around the block for at least 5 minutes, we eventually located the end of it and jumped on while we decided what to do. 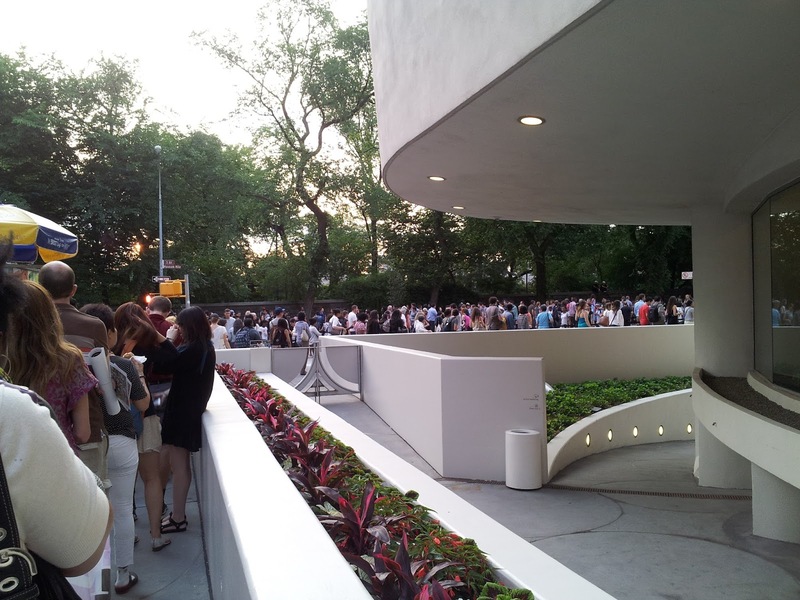 The line went all the way around the block and ended very near the beginning of it, right in front of the famed Frank Lloyd Wright-designed museum. I was ready to call it a day. I'm not much for crowds and had begun to seriously wonder what on earth I was thinking even showing up at such an event. But Scott wanted to be a New Yorker and wait. As a local friend so aptly pointed out on her blog recently, it's what New Yorkers do. We wait on line (not in line, mind you, like the rest of the country). For everything and anything. So we waited, moving slowly, but moving nonetheless. It actually passed reasonable quickly and afforded great people watching. We were especially amused by all the people who approached the line when we were already near the front of it and exclaimed at how crazy the line was. If they only knew how long it really was! Ha ha ha! We're almost to the front of the line! After waiting for about 30 - 40 minutes, we reached the front of the line and after a cursory check of my small bag, hurrah, we were in! 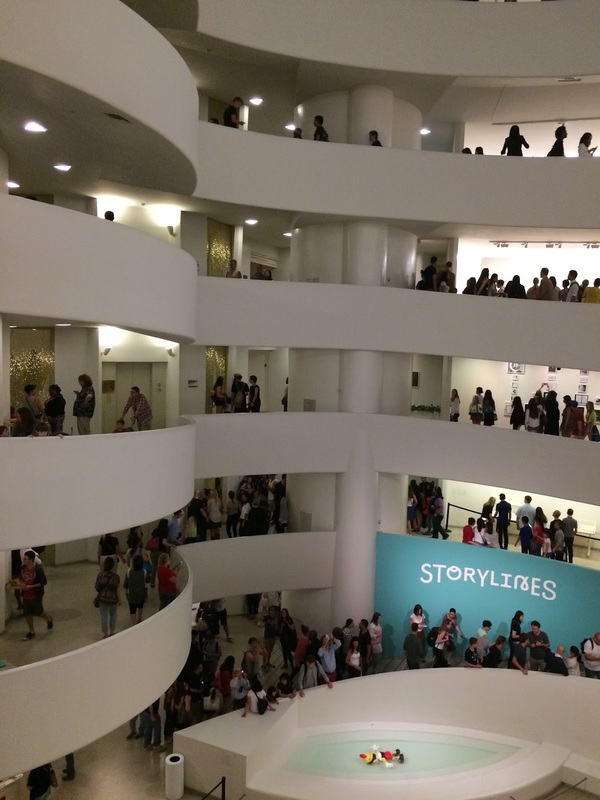 The line continued as we entered the museum but dissipated quickly as museum-goers splintered off in different directions and began moving at varied paces. As the night sky began to fall, we wandered down the street, along with the thinning crowds, right in the center of 5th Avenue (it was worth the trip just for the novelty of walking down the middle of a usually-busy NYC street!). 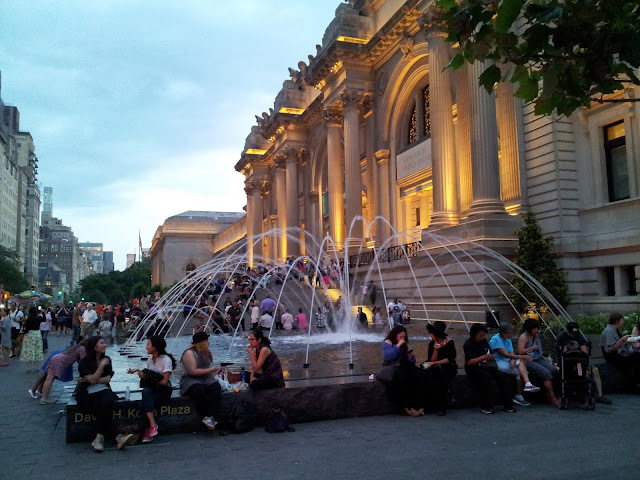 It was too late to get into any more museums and we stopped at one of the numerous halal carts that are always in front of the Met for a dinner of chicken kabob and Italian sausage. Sitting on the edge of the fountain off to the side of the grand, floodlit steps of the museum, eating our street food, we enjoyed the feeling of the still-warm night air on our skin and of being a part of this great, vibrant, sometimes-overwhelming city we now call home.